Teachers are you tired of searching for quality resources that are new and engaging? Look no further Simply Sprout has what you have been searching for. Amanda and I have been busy creating lots of new resources for the classroom. If you like what you see and want to find out more please visit our Simply Sprout Store and become a follower, you can follow us on facebook and on our website as well. If you are a follower you will be the first to view newly posted items for the classroom as well as be the first to know about our sales and promotional contests. We hope you enjoy our latest items. The kit featured here is one of our favorite new kits for Fall. It has everything you need to teach concepts related to apples and then design a bulletin board around your student's work. Our Apples, Apples Everywhere kit contains 160 pages of apple resources for the classroom. Designed with Elementary students in mind the kit focuses on grammar skills, creative writing, and basic science concepts. 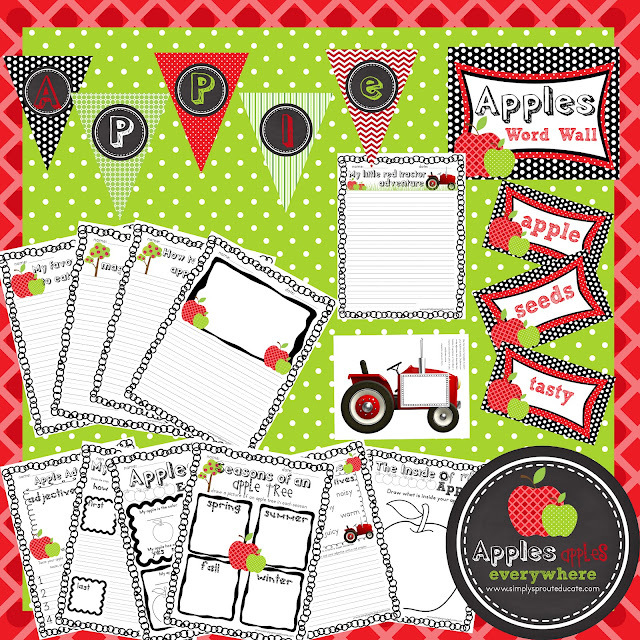 The crisp black, red ,green and white used on the pennants and the apple themed word wall are a colorful addition that will brighten up any bulletin board and bring your student's work to life. Our kit is simple to use, just print, cut and decorate. With just a few simple steps you are ready to get your students excited about apples! The word wall contains a word wall header sign and several 3x5 apple cards with apple related vocabulary terms on them. A blank design is also included so you can add your own terminology that fits your students needs. You can label the parts of an apple or use describing words to label your apples with adjectives. Our grammar pages focus on adjectives and nouns helping students to strengthen their sentences by adding some super new describing words. An easy science/writing activity for your students. Have them examine the inside of an apple and then labels its parts. This activity is simple enough for primary students to be able to complete independently and is also a very valuable tool for our upper elementary friends helping them to learn basic science strategies that will help them learn how to document experiments and labs through labeling. You can purchase our kit by clicking on the picture above. Let us know what you think in the comments below. We will pick one winner on October 15th to win a free kit! Just sign up to be a follower and leave a comment below! I'm already a follower! Love love love teaching apples! This look amazing! This is one of my favourite themes to teach! I LOVE apple kit!!! You are so talented. I'm your newest follower. Hope you have a chance to stop by my blog sometime soon. Congrats to Lucky Number 2! You are our winner we will be sending you the apples kit for you to use in your classroom!